Cymbeline has an excellent location just 5 minutes walk from: the railway station, town centre, theatre and the beautiful river Avon. Private parking can be arranged upon request at no extra charge, subject to availability. From the West, come via the B4035 from Evesham. Best way from the South is from Stow-on-the- Wold, A424, A44, B4081, and B4632. From the North and South travel on the M40 to J15. 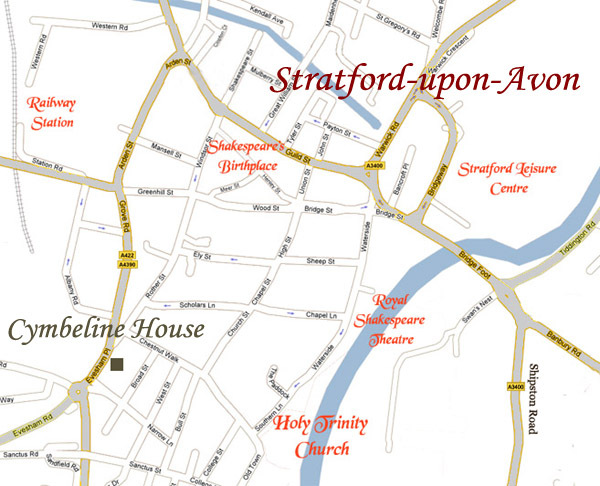 Take the A46 then the A439 to Stratford upon Avon, and as you approach the one-way system in Stratford town centre, take the right hand lane then bear left to enter the town centre (Bridge Street). At Barclays Bank roundabout, turn left into High Street. Follow the road to the end, turning right into Chestnut Walk, at the end turning left into Evesham Place. Cymbeline is on the left, just past the pelican crossing. Mobile users: click here for online directions between yourself and Cymbeline directly on your mobile phone.